Saplings are generally purchased from a nursery. It should be less than 1 yr old sapling. cost us around Rs 50 / plant. The plant responds well to organic manures. Adding 10 T FYM per acre is always good before planting. After addition of manure in the main field, pits are taken 60 x 60 x 60 cm’ Addition of 10 kg FYM with Neem cake powder 1 kg/pit is advised. Wider spacing is maintained in rainfed areas( suitable for intercrops) say 15 ft x 15 ft. if a good source of irrigation is there then closer spacing can be maintained..12 x 12 ft is recommended with 250 -300 pl/acre is ideal. After planting provide some support/staking to plant. Legumes like soya bean, cowpea, green and black gram followed by leafy vegetables like coriander, fenugreek etc. When the plant reaches 1 mt cut back top portion in March -Aprill. 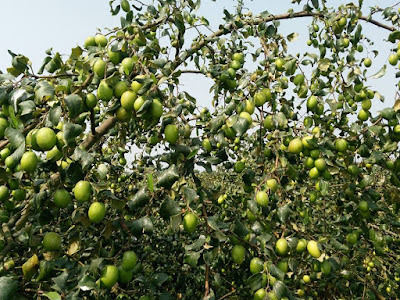 This is called training.This leads to the production of 3 to 4 side branches in different directions.Don't allow branches to grow downwards and crisscrossing prune them, retain only 4 to 5 healthy branches as above said. How to stop flowering in initial 3 yrs? 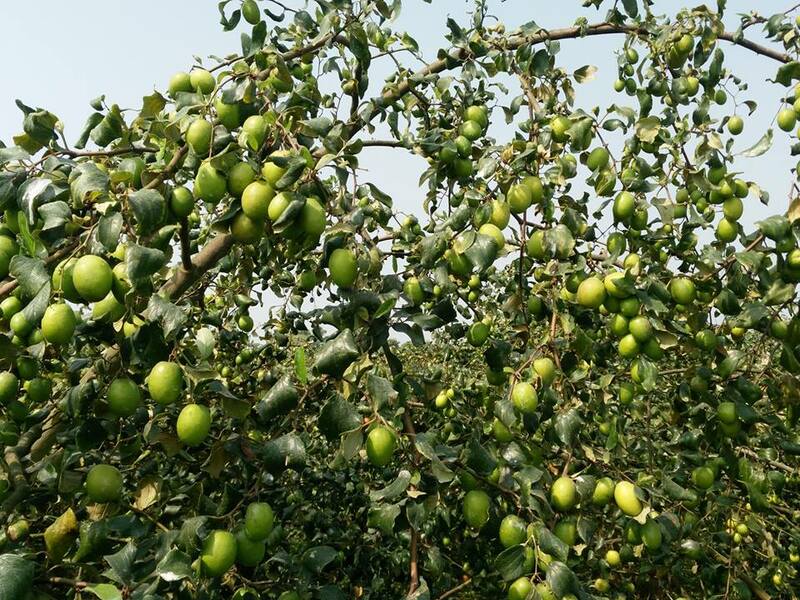 Fruit fly and powdery mildew are concerns in apple ber. Install fruit fly traps. Fermented Buttermilk spray, 6 lit in 100 lit of water.2 sprays with a 1-week gap to control Mildew. 1.I have mango orchards. The distance between tree to tree 26 feets. Can I do sapling between these 4 mango trees? Yes, if you train mango plant also. 2.Which is the best time for pruning? After harvest , usually 15 - 20 days after harvest is good. Plant enters in to a dormant stage in march-april by shedding leaves. This is the right time. cut back branches by retaining 10 - 13 nodes on each branch. 3.Does this crop yields comes twice a year? Nursery people are saying twice a year.not aware of any such hybrid. 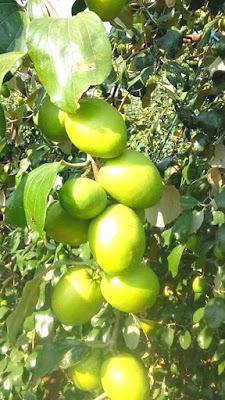 One time fruiting only and yield which my friend is obtaining is around 60 tons per hectare from 4th yr. He is using chemical sprays and fertilizers. It is based on a number of plants per hectare. people are going for high density planting also if good irrigation available. 4.We have road adjacent to the fence. Can I plant appleber on one side of the road. 5. In high-density planting, the tree height should not be allowed to grow more than 10 ft is it true? Can.but half yield will be picked by other side guys.take care of that. 6. In high density farming tree heights are not allowed to grow beyond 10 feet , Is it true? High density farming can be done for all fruiting plants? 7.What about irrigation in less rainfall areas how should 1 plan? No problem in kharif plant can sustain without irrigation for about 1 month. Planting sunflower n maize here n there in the main field will help in irrigation. They are water sensitive plants. Wilts if moisture in soil comes down, irrigate the main crop as n when you notice wilting of a maize plant.